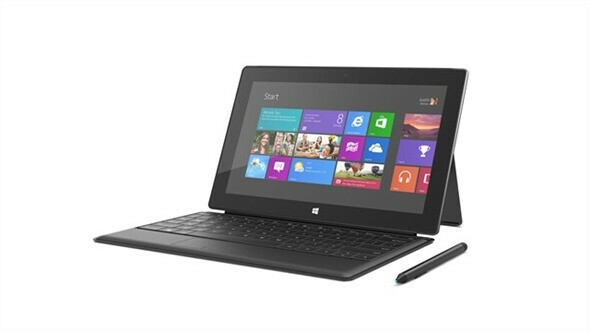 The Microsoft Surface Pro launched on Saturday and the 128GB model quickly sold out at the Microsoft online store. This version of the Microsoft Surface tablet features a dual-core Intel i5 core processor, runs Windows 8 and the same apps that run on your desktop box at the office. In fact, this idea of the Microsoft Surface Pro being for business use is the focus of the first television ad for the slate. Like the debut ad for the Microsoft Surface RT, there is dancing and even some karaoke thrown in for good measure. The ad displays some of the features of the Microsoft Surface Pro including the stylus support and the USB port. The 128GB version of the tablet is $999 with the 64GB model priced at $899. This price does not include the Touch or Type Cover. The Touch Cover is $119.99 and offers a touch enabled QWERTY keyboard that doubles as a protective cover for the screen. The Touch Cover is available in Black, White, Red and Cyan. The Type Cover offers more traditional raised keys for $129.99 and is available only in Black. You've seen how the Microsoft Surface RT has been marketed to the kids. Now we have a different computer aimed at a different demographic. So far, it's been all good news for the Redmond crew. What? That's the same as a MacBook Air! N what do you mean it's a closed ecosystem so we should all use Android laptops or what? Don't hate for no reason. Troll elsewhere. Developers and ordinary folks have been using Windows for decades. Closed huh? Could it get sillier than this? I hope not. But I think yes. With Microsoft's Balmer-style, nothing worse is impossible. Nice advertisement and those dance moves are awesome. Another great job Microsoft! Nice Ad though i didn't get the point why they are dancing. Maybe because i didn't listen the audio. they have that and what do you have in return? a closed heart to accept facts or anything new and a dead brain..wow great..you're amazing!! There was too much dance and let's stuff about the product. The dance always doesn't send any message about the product. Then how come Glee is so popular....lol. Forget the hype about low memory. I am sporting a Surface RT 64GB with over 30GB useable space AFTER installing tons of apps and downloading content from my Skydrive account. If you are worried, get the 128GB with a MicroSD extended card and you are looking at tons of useable space, Skydrive. As well, on the Pro version, you can attach almost any USB device, so external Hard Drives, USB DVD drives, etc. This is the first of likely several ads, many to come that may show much more what can be done. It was nice to see them interchanging covers, adding USB devices, using the digital pen, full Office. WTF was that about, the next trailer for Break Dance 2013 ? But then again, iPads ads seem to sell becase they simulate a piano....and not much more so who knows maybe it'll hit it's target.... whoever they may be. I remember reading people (consumers) loved that (first) ad and attracted toward Surface RT after seeing it. I am sure Microsoft knows it too and that is why they redo the Pro version (office environment and office personals) for the Surface Pro version. Dance represent how sleek, smooth, fun and easy to use Not only Surface Pro (device) but Windows 8 as well. They did show the use of Pen, the Applications. Why some of the commenters keep forgetting that this thing is the REAL DEAL, it is full Windows PC. Up there someone was talking about closed and open source stuff. Let me repeat that POWER is not for everyone. and Secondly Windows have got zillions of software for just everything. It is far better than any open-source plateform at this stage. cos most of the commenters here that bash are from android camp and most of 'em are brain dead...zombies...they only know whats good about android and nothing else.. I use an Android tablet too, I think for the time being it is an OK OS for tablets and smartphones, although I am not completely satisfied with it but that's just me. For consumers it is more than fine. And you are right calling them brain-dead and zombies because they should understand for the sake of common-sense that no mater how many cores they put into Android (or iOS, or WP) they cannot use it as a full desktop system. This is not the case of Surface Pro, because it is a full proper CPU machine. I can put keyboard, mouse, a monitor and perhaps an external hard drive and use it as desktop. I did use my tablet with keyboard, mouse and monitor but that can never be as good as proper pc. This is what these people failed to realize. Actually, people asking what it can do and thinking this ad did not do that. in comparison to the first "Click In" ad, I took a few screen shots from this ad and saw these features front and center' 1 Digital pen with built in holder 2 Touch Cover typing 3 Digital Pen navigation 4 Digital Pen fine selecting of links and text 5 Digital Pen electronic ink 6 Touch navigation 7 USB Port 8 On screen Soft Keyboard use 9 Applications (microphone recording) 10 Paperless office (tossing all those papers, previously unseen is not pointless) 11 Full Office (One Note shown) 12 eMail app 13 Heavy use as both a tablet and a PC What it didn't show was Xbox and Skydrive integration, integrated theming and desktop images. There was much more than the dancing, but if one knows a little about subliminal advertising, there were tons of little hooks and likely hundreds of images interspersed in graphics showing how modern and cool the device is. Even some sexual innuendo. We can only hope the rumors of more devices to come holds true and that this is the start of a whole new line of PC. While some OEM are stepping up (Asus, Acer, etc) some are more than dragging their feet and admitting they cannot compete in the new market (Fujitsu) I for one am holing off to see if the rumored Surface phone is in the offing. While I have a Surface RT and love it recently took it on a business trip to the States and never looked back (USB headset for Skype and USB mouse, though I only once pulled the mouse out of my bag). Found no need to take the huge array of desktop applications with me. Only fail was linking to a Google Hangout, but convinced the other party to switch to Skype and all was well.